The Lexus ES 300h is a gasoline-electric hybrid version of the Lexus ES series of full size luxury sedans. The Japanese luxury auto manufacturer introduced the series of front-wheel drive, V6 vehicles in 1989, although a four-cylinder version was later added, as well as the gasoline-electric hybrid ES 300h. The Lexus ES is currently in its sixth generation. It was the first front-wheel-drive Lexus vehicle and served as the entry level Lexus in North America until the Lexus IS was introduced in 1999. Though the first five generations were based on the Toyota Camry sedan, thanks to Toyota’s ownership of Lexus, the sixth generation broke from this pattern and borrowed its platform instead from the larger Toyota Avalon. The Lexus ES series is assembled at a Lexus production facility in Miyawaka, Japan. Though the sixth generation of the Lexus ES is not available in Japan, the Lexus ES 300h is sold in other global markets, such as North America and China. Lexus introduced the sixth generation of the ES in 2012 as a 2013 model year vehicle, and the hybrid Lexus ES 300h was part of the new generation’s lineup. It was introduced at the New York International Auto Show in April of 2012. Like the Lexus ES 350, which the 300h is based on, the vehicle seats five occupants. However, the hybrid system is all new for the Lexus ES series, though it is closely related to the hybrid drivetrains found in Toyota vehicles. The gasoline engine is a 2.5-liter four-cylinder unit that has been paired to an electric motor and a battery pack for a combined output of 200 horsepower. The only available gearbox is an electronically controlled continuously variable transmission. The powertrain in the Lexus ES 300h achieves Environmental Protection Agency fuel economy ratings of 40 miles per gallon city, 39 miles per gallon highway, and 40 miles per gallon combined. The exterior of the Lexus ES was updated for its new generation, so the Lexus ES 300h comes standard with the ES series’ new xenon headlights. Other equipment includes 17-inch alloy wheels, fog lamps, heated mirrors, keyless entry and ignition, dual zone automatic climate control, LED daytime running lights, and a sunroof. Inside, the Lexus ES 300h features the same characteristics as the rest of the ES lineup, such as the Lexus Remote Touch interface with a seven-inch screen, a rear view camera, surround sound audio, leather upholstery, eight-way power front seats, Bluetooth wireless integration, and an eight-speaker audio system with satellite radio, iPod and USB connectivity, and an auxiliary input jack. Navigation, voice control, real time traffic and weather information, driver memory settings, parking sensors, heated and ventilated front seats, ambient interior lighting, blind spot warning, lane departure warning, and smartphone app integration are among the options. As far as aesthetic options, buyers can select a bamboo wood interior trim package for an extra touch of luxury. In addition to the technologically advanced comfort features of the Lexus ES 300h, the safety features are also typical of the luxury segment. 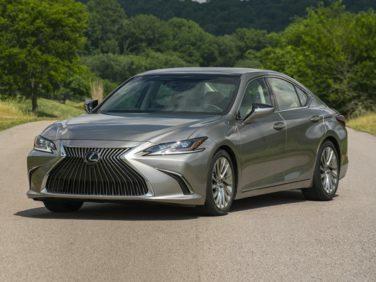 The ES 300h boasts the Lexus Safety Connect system that has automatic crash notification, stolen vehicle tracking and a button to summon emergency assistance. Buyers can opt for front and rear parking sensors, automatic high beams that detect oncoming traffic, blind spot warning, and adaptive cruise control with a pre-collision system that gets the seat belts and brakes ready for a crash.